From Boing Boing by Cory Doctorow on Saturday, Feb 11th at 12:45am (year not stated) - Statistical methods have been used to settle the question of wartime atrocities committed by Indonesian forces against the people of East Timor. The island of East Timor (now Timor-Leste) was occupied by Indonesian troops from 1975 to 1999. A truth and reconciliation commission was convened to explore the scope of the mass murder on the island, and Patrick Ball, a "forensic statistician" was called in to extrapolate the full scope of the wartime deaths that can be laid at the feet of the Indonesian occupiers. Patrick is a friend of mine, and his work on this is truly ground-breaking -- he's testified at Milosovic's trial, for example. He's an amazing example of how math can make a different in the real world. To generate the East Timor report, HRDAG researchers spent three years in the country -- now called Timor-Leste -- collecting and analyzing mountains of raw data. The group marshaled 8,000 testimonies and developed innovative sources of information, including the first human rights retrospective mortality survey to determine how many people died and why. They surveyed 319,000 graves and used hundreds of Python, Java and bash shell scripts to build a huge database of mortality data that contained an 80,000-file directory tree. While prior information about East Timor focused on anecdotal accounts, the HRGAD researchers used comparative analysis of the datasets to uncover patterns of deaths and build objective evidence of abuses. The team also developed an array of descriptive statistical analysis profiling the scale, pattern and structure of torture, ill-treatment, arbitrary detention and sexual violations. In order to estimate what was missing from the data, the HRDAG developed software to link multiple reports of the same death in a technique called record linkage. They then used multiple systems estimation to calculate the deaths no one remembered. "The Indonesian military has persistently argued that excess mortality in Timor due to its occupation of Timor was zero," said Romesh Silva, a HRDAG field statistician who led the design and implementation of the project's data collection. "This claim can now be tested empirically and transparently with the tools of science instead of merely being debated with the tools of political rhetoric." ETLJB Editor's Note: Pictured are the now deceased Butcher of East Timor - Soearto, with one of his principal co-war-criminals Sjamsoeddin. 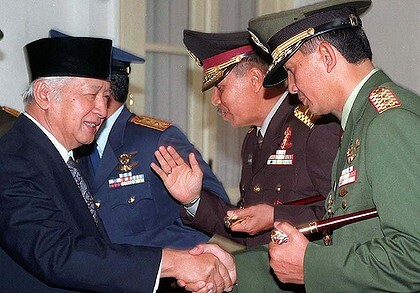 Rather than rejecting the past, the Javanese elite are legitimising it by failing to prosecute its citizens who stand indicted of war crimes and crimes against humanity during the bloody twenty-four year occupation and, in some cases, even promoting them to high positions in the Indonesian state apparatus. It also sends a message to other separatists that the military will not be held accountable for human rights abuses.